As you may have noted, I was in Maui a couple weeks ago for my daughter, Jenny's, wedding. We were there a week; and of course the rehearsal and actual ceremony took only two of those days. So, on one of the other days, some of us went snorkeling, which is where I wound up on the losing side of a battle with an anonymous sea urchin. Sea urchins, sometimes called sea hedgehogs ("urchin" is an old term for hedgehogs), are ubiquitous in the ocean, living everywhere from the intertidal regions down to 5000 meters (15,000 feet). They are part of the same family that includes sand dollars. They are typically covered with spines that wave freely in every direction. If a spine is touched, the other spines quickly swivel towards that spot, which can painfully penetrate a human's skin. There is debate over whether the spines themselves are poisonous, unlike the pedicellariae between the spines, which are definitely venomous. However, I can tell you from personal experience, they hurt. While snorkeling in Maui, at a reef just by a lava beach, a wave came along and pushed me toward a lava outcropping. Of course it is considered poor form to actually touch a reef, because oils in our skin can damage or even kill a section of coral. 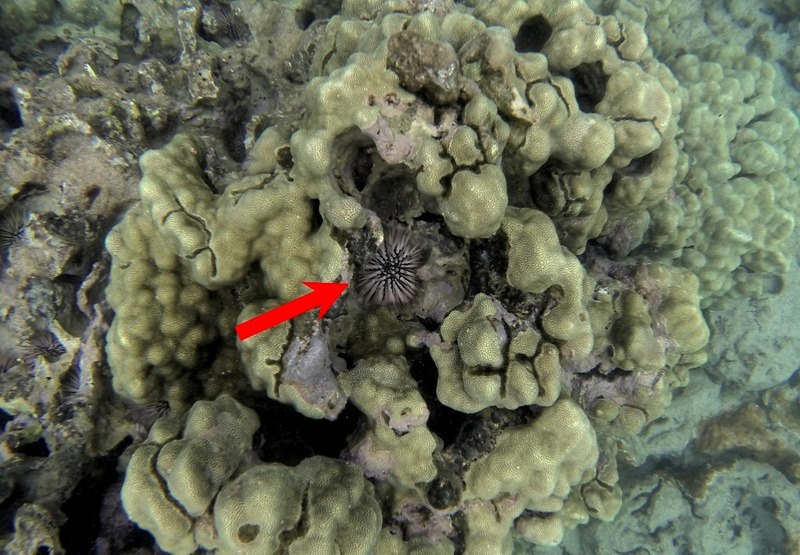 There wasn't much coral in this reef, at least, not close to shore where I happened to be; but I had noticed that in every nook and cranny in the lava formations, there was a little sea urchin. So I was really trying to not touch one! Nevertheless, the wave hit and my toe suddenly felt as if I had banged it really hard on the lava. When I left the water, my big toe (on my left leg, of course, which for some reason always gets the brunt of my misadventures) was bleeding profusely; so I declined to go back in rather than act as shark bait. At the rental condo, I poured standard hydrogen peroxide on my toe and the other spots on my leg that had been dinged up. I figured I had cut myself on lava, stuck on a bunch of Band-Aids, and frankly didn't give it another thought. After all, I am still taking maintenance doses of oral hydrogen peroxide, so I shouldn't get any infections, or at least should recover quickly from them. But, once I got home, I began to realize a spot on the bottom of my toe was hurting, as if there was something in there. So I made an appointment with the VA doctor at the local clinic and saw him this morning. After one glance, and my explaining what had happened, he ordered me to go directly to the VA Medical Center in Phoenix to see a podiatrist. The podiatrist, a physician's assistant named Colin, was so handsome I could hardly hear a word he said. But, apparently, I had gotten a whole bunch of sea urchin spines in my toe. "I've never seen this in person," he admitted. I shrugged. "I'm not surprised," I said. "Not many sea urchins in Arizona!" 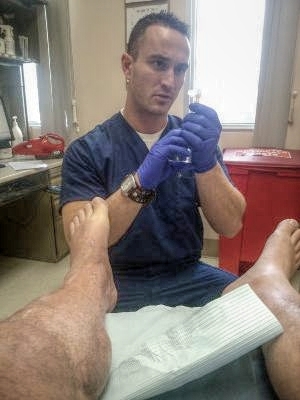 After explaining what he planned to do, Colin gave me a shot of lidocaine in my toe. That's the most painful part of the procedure, but I didn't notice because I was busy trying to take his picture with my phone without seeming too creepy about it. 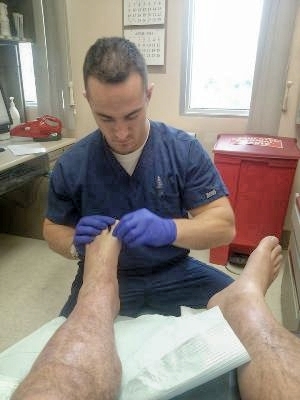 Once the anesthetic took effect, Colin proceeded to pluck, not one, not two, but twelve sea urchin spines from my toe! Two of them were buried so deep he had to make an incision to get them. Fortunately there was no pain so I was able to entertain Colin with a couple of slightly racy jokes as he worked. When he was done with the spines, just for good measure he removed a small wart from the bottom of that foot—all at no cost, of course; how I love Obamacare! One thing Colin couldn't quite understand, though, was how come my toe had not turned bright red and swollen to the size of a tomato. "This should have given you a nasty infection," he said. "Yet, except for the fact that your toe was punctured by a dozen foreign objects, it seems none the worse for wear." So I explained about the hydrogen peroxide, and he expressed an interest in researching further into it. The man is going to make an awesome doctor by the time he completes medical school!